Book your Maruti Suzuki CIAZ Car Bookings at Dealers in Odisha from tomorrow, 3rd September 2014. 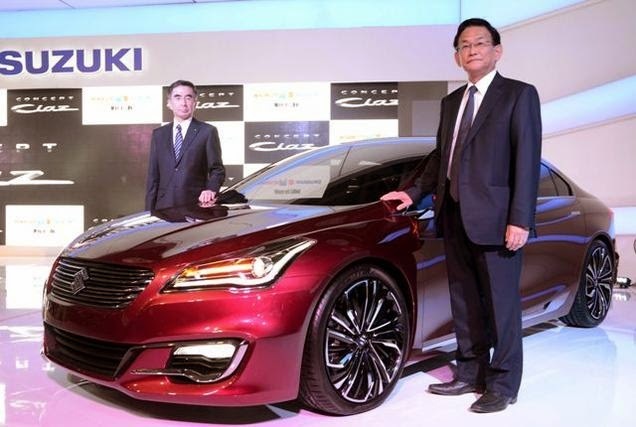 From September 3rd 2014 you can book your Maruti Suzuki CIAZ car through the Maruti Dealers near your Area. The Ciaz is Maruti's all-new sharp designed mid-size sedan for India.You can Call the Tollfree number 1800 102 1800 for more information. The Maruti Ciaz has a petrol engine of 1372cc, four-cylinder and also with the 1248cc, four-cylinder diesel engine. The petrol engive version of CIAZ motor makes 91.18bhp and 13.25kgm Torque Power while the diesel engine variant of Maruti Suzuki CIAZ Car makes 88.76bhp and 20.39kgm torque Power. The petrol CIAZ motor comes mated to a five speed manual and a four-speed automatic gearbox, while the diesel variant gets only a five-speed manual 'box. One of the great Feature of Maruti Ciaz Car is its Space. Compare to the Hundai Verena and Hona City its the most Spacious car with the excelent features. Infact the Wheelbase of Maruti CIAZ car is 2650mm which is more than that of Honda City (2600mm Wheelbase) and Hyundai Verna with a 2570mm wheelbase.